Published in Portuguese in 1995 and in English in 1997, you wouldn't find José Saramago's Ensaio sobre a cegueira (translated as Essay on Blindness, or, as published Blindness) in the "new and hot in fiction" section at Chapters. You may spot it with its film poster cover sitting prominently where movie-goers-turned-readers might find it under the "what's hot right now" banner. It was, after all, only recently that Saramago finally allowed his much revered novel to be transformed into a film, sparking new attention to the Nobel Prize winning story. If, however, you seek the authentic cover, dig a little deeper into the shelves of the fiction section, and you may find it. 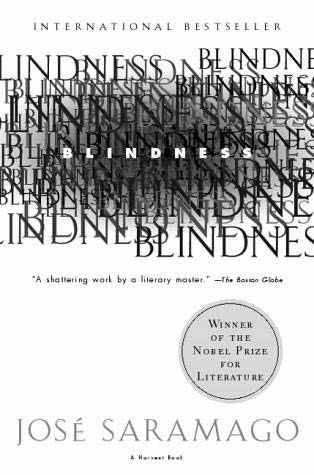 Blindness, a stark social commentary intertwined in a heartbreaking narrative of a society struck with an epidemic of 'white blindness', is easily one of the best books of this generation. The story follows nameless characters as they are struck down by the inexplicable white blindness, and subsequently interred by the government in the most deplorable conditions imaginable. Guided by the fortunately clear eyes of the doctor's wife, who has miraculously remained unaffected by the blindness, the small first group of internees evaluate the initial situation, adjust when new people are mercilessly thrown in to join them, and unite when the situation escalates to horrific levels. The abandoned mental asylum where they're so inhumanely kept is at first discomforting, but soon becomes the epitome of hell on earth when more than three hundred confused, upset, angry, irritable, and defensive blind people eventually become confined within its quarters. What happens within the blind society, both inside and outside the asylum, comments on human nature in times of strife, and questions human compassion, morality, and humanity itself. Blindness brings a dark truth to the cliche "desperate times call for desperate measures" by demonstrating the types of sacrifices humans make when in dire need of food, clothing, and safety. The story is made increasingly vivid through the functioning eyes of the doctor's wife. While the reader can only imagine what kinds of conditions would exist in such a scenario, the doctor's wife brings a sad, and often times worse, descriptive reality to the situations. Despite the unsettling circumstances surrounding the novel, it is also a thing of such undeniable beauty, which is in part why it is such a perversely irresistible novel. What makes it so disturbingly beautiful is Saramago's poetic ability to write in a manner that describes even the most deplorable conditions with such lyrical fluidity that you are able to continue reading, even though it is so sad. Saramago also creates such real, raw emotions within his characters that their vulnerability, determination, and complete desperation is actually heartbreakingly relatable. You know their situation is something unlike anything you will ever know, yet the peril of those nameless characters, like the girl with the dark glasses and the first blind man's wife, seems so real. Saramago's style is much like his other works. Sentences are seemingly endless, with sporadic punctuation and no quotation marks. At first, it is difficult to determine who is speaking, and challenging to follow sequences of events, but after a while, this style compliments the slightly chaotic, confusing situations in the novel, making it easier to follow. Also, one of the key factors of the novel is that in addition to having nameless characters, the epidemic takes place in a nameless city in an unidentified country, which speaks to the universality of the novel's message, and the blanket comments and questions on humanity. This reinforces the notion that despite cultures and facades, the inherent nature of human beings is the same; we are all equal. This story invokes empathy towards the characters and the city's situation, because it literally could be anyone, anywhere in the world. Blindness is a novel unlike any else. It is ironic, sad, terrifying, and above all, brilliant. It is a book that provokes thought, reevaluation of morals and priorities, and a new appreciation for everything we are blessed with. An old song warns "you don't know what you've got 'til it's gone", and that, as simple as it sounds, is a metaphor for everything that happens in this story. It is an incredible story, fascinating and dark, sad and beautiful. And while the movie will certainly be an excellent rendition, there is nothing like reading the book. A review and description of novels by Nobel Laureates Hemingway, Gabriel Garcia Marquez and Jose Saramago, all of which are perfect summer reads.